There is no progress without change, and no matter how good a thing might be, maintaining the course will only work for so long. Such is the case with Boomtown, which in the past several years alone has rocketed from an imaginative, wild weekend of reggae, drum and bass, trance and folk into the most popular, widely attended independent festival in the UK, with enough clout to book acts as massive as Die Antwoord and Gorillaz. At Cultured Vultures, we have a small stable of festivals we hit up every year, but with Boomtown we’ve developed a very special relationship, diving headfirst into the ever growing narrative that underpins the festival. This made it all the more enlivening to discover that after this last chapter, the tenth, Boomtown will be undergoing some major changes. It’s a timely decision in a myriad of ways. Firstly, 10 is a nice round number, secondly the scale of the festival is placing it in danger of outgrowing itself and thirdly, the message the team are trying to send is somewhat getting lost in the noise. For the past few years, particularly since Martin Coat joined as theatrical director, the narrative has become more allegorical, and the team have utilised it to spread important messages about society, humanitarianism, safety awareness and the environment. This year, they hit that button particularly hard, with the ‘Respect’ campaign (Respect Yourself/Respect Your City/Respect Each Other). The narrative itself, meanwhile, directly followed on from the corporate takeover witnessed in Chapter 9 to exhibit a Boomtown engulfed in advertising, new developments, social displacement and unrest. It was a little overwhelming at times, especially when you saw guests hurtling down the muddy streets being pursued by BHI heavies or duster-clad hackers, but it all played into the atmosphere. Despite these efforts though, the issues that plague every festival of this size are still present at Boomtown – excess littering, abandoned tents, drug related medical issues, shysters touting fake tickets. More than virtually any other festival though, Boomtown have worked tirelessly against that, repeatedly hammering home messages discouraging irresponsible behaviour and encouraging safe, sensible drug use, and now it seems like they’re bringing that further to the core of what Boomtown is than ever before. Certainly, this year’s experiments with upscaling and remodelling seemed to demonstrate growing pains. The addition of Disorder Alley, with its Bauhaus angles and thrumming punk soundtrack was very welcome, as was the transformation of Mayfair into the even more affluence Paradise Heights and Chinatown into Metropolis, a shift in stylistic influence from Blade Runner to, well, Metropolis. The inclusions of Boomtown Springs, a new quiet camping area with better facilities, a pool and more comfortable bespoke lodgings, however, fell somewhat flat. This is a minor gripe, though, and it was a viable attempt to appeal to a subset of festivalgoers less enthused by the famously rowdy camping environment Boomtown offers (Human Traffic, anyone?). Really and truly, besides the narrative, which was well handled this year, the line-up is always the biggest sticking point and this year’s was the best in Boomtown history by a considerable margin. The spread of DJs from small hectic haunts like Scrapyard and Desperados Clubhouse all the way to the monolithic, fire-spewing likes of Robotika, Bang Hai Tower and, of course, the mighty Sector 6 was as impressive as ever, with incredible showings from Krafty Kuts, Shy FX, Eats Everything, Swindle, the Critical Sound collective and the secret headliner – Andy C.
Meanwhile, the live shows across the many districts felt more carefully and artfully planned than ever before, from mesmerising, jazz infused showings from Sampa the Great, Nubiyan Twist and Too Many Zooz at Whistlers Green to bunker busting madness in Disorder Alley courtesy of Dead Kennedys, Napalm Death and Random Hand, to name a few. On the larger stages, Deluxe gave an astonishingly energetic offering, as did, and I’m far from kidding here, Limp Bizkit. Of course we all know who I’m working up to here – Gorillaz. I’m more than a little bit biased here, I’ve been a fan since I was 10, and seeing them live was always going to be an emotional experience for me, but I couldn’t have predicted how amazing Damon Albarn and his 13 piece band’s offering would be. Featuring guest showings from Little Simz, De La Soul and a mobile recorded Snoop Dogg and a setlist which was almost dominated by tracks from their best album, Demon Dayz, they gave which many are agreeing was one of the best performances not just in Boomtown history, but live music history, and I’m inclined to agree. So, how did it all end? Well, after Andy C was done setting Sector 6 ablaze, as he is wont to do, AMI was unveiled. She answered two fan questions before Nikolas Boom, the town’s enigmatic founder, took over the transmission to ask AMI who the Masked Man was, causing her to reveal that he was, in fact, a cyborg designed by BHI to incite the revolution of Chapter 8, enabling them to take over. Thus, BHI was toppled, paving the way for a new Boomtown – A Radical City. How will this new city look? What will remain? What will disappear? It’s anyone’s guess, but the way Boomtown has been able to mature and recognise the right moment to move forward is encouraging and exciting. There will always be problems, no crowd of 60,000 people is short of the odd disrespectful gaggle of twats, and no festival large enough to contain a crowd like that is immune to unforeseen mishaps. 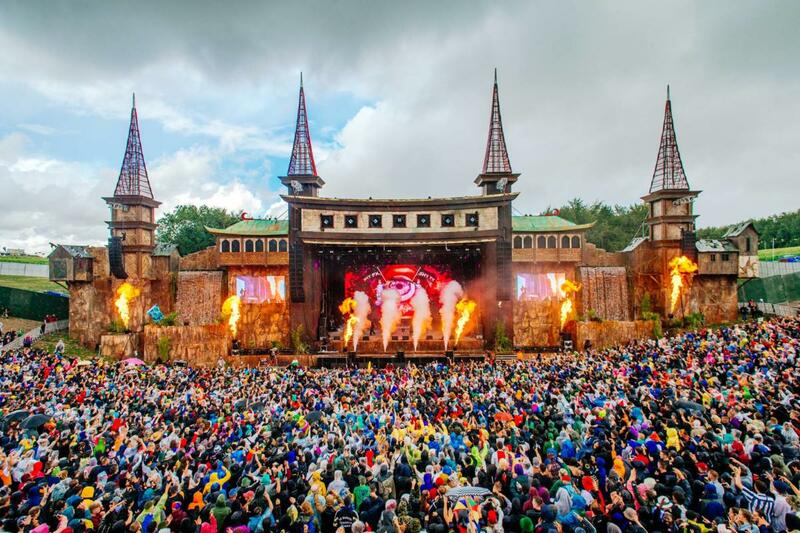 Boomtown have their eyes on the prize though, and like Glastonbury, the festival that inspired it into existence, they are intent on maintaining their core values beyond everything else. I love them for that, and if you take the time to venture into the city, I guarantee you will too.